Last weekend I participated in the Nuit du Hack CTF Quals 2013 with my teamate delroth, you can find an excellent write-up about escaping a Python sandbox on his blog. So I decided to post a writeup too about the last crackme challenge "Crackme #1". Do you remember last ndh prequals ? no no I will not talk about bmp chall but about VMNDH-2k12, it was exactly the same VM (I'm very sad to have lost some hours to reverse something that I know), the only changes was the opcode values, so this post will not deal with the vm stuff you have all the information on this website. Real vm code start at offset 0x06 (byte 0x0A) and the size of the vm code is 0x371 (881 bytes). Do you want to mary me ? If you have trouble for dumping vm_opcode, you can find the dump here. I'm an idiot to reverse an entire vm and not figure out it was the same than last year, but during ctf you want to be the fatest and don't (always) think about old challenges. Another solution was to count the number of instructions executed by the vm, yeah because when you write crackme, I think you should compute hash, or something like that, because consecutive if statements is just lulz. charset="a b c d e f g h i j k l m n o p q r s t u v w x y z A B C D E F G H I J K L M N O P Q R S T U V W X Y Z"
charset="$charset _ - ! $ % ^ \\& \\* + = 0 1 2 3 4 5 6 7 8 9 > < ,"
echo -n "trying key `cat guess`... "
Edit script for replacing first letter by "A"
And do it for the 8 letters. Last weekend I participated in the GitS 2013 CTF for team SoSix (team created with my friend @delroth). Here is my writeup for the pwn400 challenge, called Crunchtime. Crunchtime is a linux elf64 binary which is an hash generating service. This option will ask the user to enter a string, save it in a mallocated buffer, and save the ptr into a pool of 0x64 (100) string table. If the user has entered more than 0x64 string, it will reset the counter of strings index to 0, and free the old string. This option asks the user which string number he wants, and print it. This function checks if the number < 0xFF and print the string. Here is the first fail, we can leak some information but there are not really useful. This option will generate CRC for all the strings entered by the user. This option will print all CRC computed and the string which is associated. But when the user is asked for a new string, it will read 0x221 bytes or read until finding 0x0A ("\n"). So we can overwrite the low byte of the return adress of this function, and the saved rbp rbx and rflags registers pushed before the call. We can see that before the call, we can find a push rbx (0x00007FFFF7FFDF4B), and we know that we can control rbx. 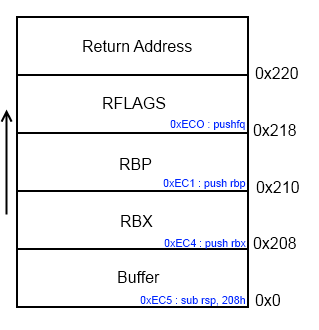 So if we overwrite low byte of the return address with 0x4B, it will push a value on the stack, and ask us again to enter a string and re-trigger the vuln. User enter the string : "A" * 0x220 + "\x4B"
Now we can control full of rip. The stack is not executable so we will have to do some ROP. The binary is of type shared object, so each time it will be executed the BaseAddress will not be the same, so the address of our gadgets will change ! We will have to find a way to leak information, especially one which help us to construct our rop payload. If the buffer doesn't end with "\n", no null byte will be put at the end of the new string, so when strlen will be called, it will go after the saved rbx, rbp, rflags, and stop at the return adress which contains a null byte in the high byte, so we can leak the return adress and we can know where our binary is loaded. As you can see after the repeated "A" we can see the return adress : 0x7ffa4e409f80. Now we are able to compute address of each gadgets with this leak, the rop payload is same as usual, we leak information from glibc, call mmap(RWX), recv into the new RWX zone and call it. It calls recv() just after, so be careful. buf = "A" * 520 + "A" * 8 + "A" * 8 + "\x02" * 8 + "\x80"
buf = "A" + "\x00" * 519 + struct.pack("<Q", 0) + struct.pack("<Q", 0) + struct.pack("<Q", 0x0) + "\x4B"
buf = "A" + "\x00" * 519 + i + struct.pack("<Q", 0) + struct.pack("<Q", 0x0) + "\x4B"
buf = "A" + "\x00" * 519 + struct.pack("<Q", 0x0) + struct.pack("<Q", 0) + struct.pack("<Q", 0x0) + "\xA1"
buf = "A" + "\x00" * 518 + struct.pack("<Q", 0) + struct.pack("<Q", 0) + struct.pack("<Q", 0x0) + "\x4B"